I love my scrollsaw. I’m not completely convinced it loves me, but I’m working to make it more of a friend. Someday, when I have the time, I would like to move up to fretwork and other, more intricate scrollsaw projects. For now, though, I mostly use it to carve out initials of grandchildren and others I make stools for. And, I can’t say I’m particularly good at it. Therefore, I had to develop techniques for sanding inside lines and curves to fix the problems I create on the scrollsaw. I use four main tools, three of which are, you guessed it…free! 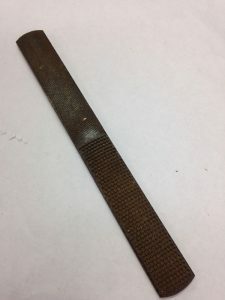 The first is a rasp (not free), and I use mine for the roughest beginning work inside letters. A four-sided rasp like this is extremely versatile. Two round surfaces, two flat surfaces, coarse and fine. By the time I get to this stage, I’ve created a panel, sanded close to a final finish, not-so-rough-sawn the letter or letters the stool needs, and I’m really not wanting to have to back up and make a new panel. Therefore, I’m taking no chances that I cut too far or suffer tearout. I’ve tried to fix minor tearout in a damaged letter before. Because it’s a focal point of the stool, the damage is nearly impossible to hide. 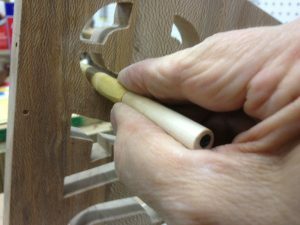 What rasping I do is performed with a little angle, directing the cut to the middle of the board. With patience in mind, I turn next to sanding, not being too concerned about how long it takes. For straight lines, nothing beats a popsicle stick. It’s as flat as you need it to be, narrow enough to fit almost anywhere, and stiff enough to stand up to firm pressure while sanding. If I need to cover more real estate in a hurry, I make a stick out of plywood. With the panel in a vise, you can even get a two-handed grip on either kind of stick. Another universal sanding/shaping tool is the disposable foam brush handle. They come in a variety of diameters, so they can fit the broadest to the tightest of curves. Wrap your sandpaper around and get to work. With these three makeshift tools you’re ready for flat and round sanding. You can even alter the size. 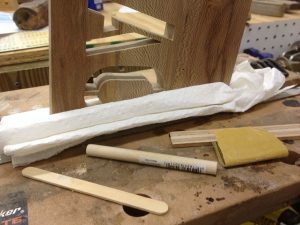 Sycamore can be tricky to sand, so it’s best to start with a high grit and be patient.